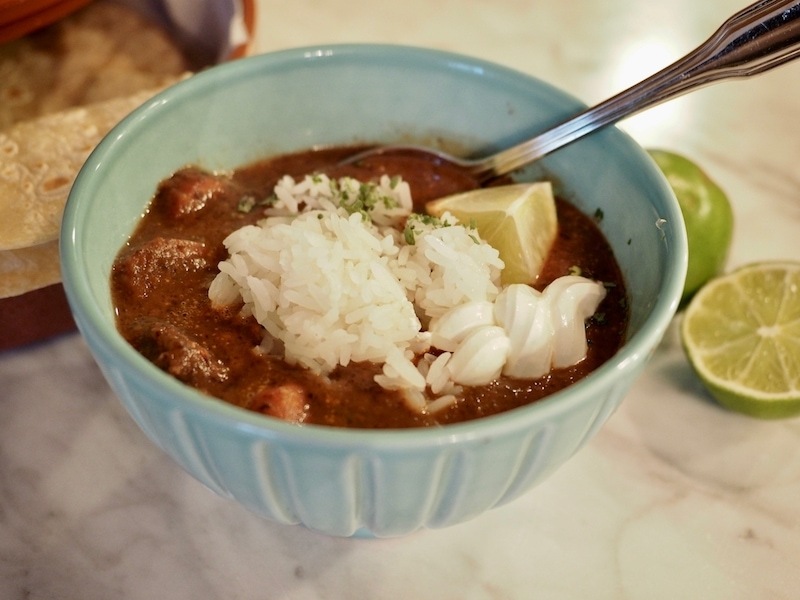 This Black Bean and Sausage Soup is thick, satisfying, creamy, and filling, with hickory and citrus notes, it will quickly become a family favorite. 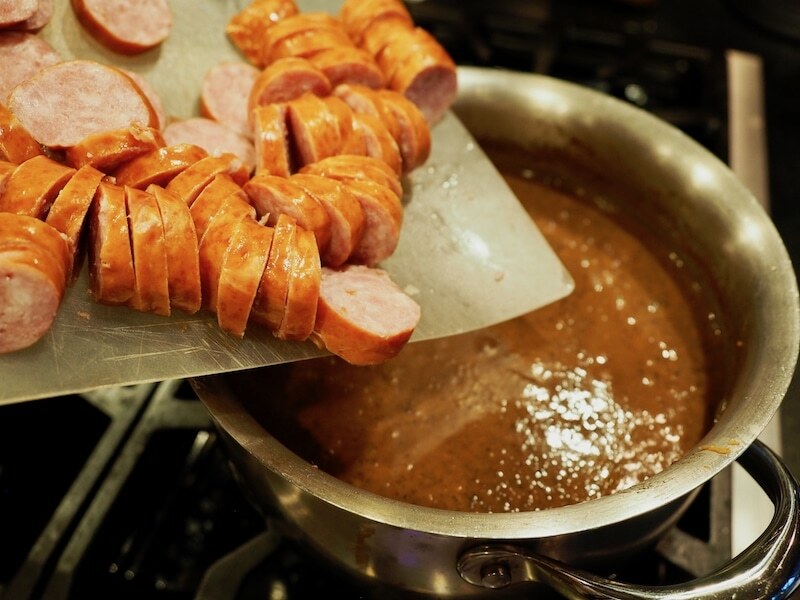 Loaded with good-for-you black beans, veggies, broth and if desired, diced kielbasa sausage. Fully customizable with all sorts of delicious garnishes, this hearty soup is filling enough for dinner, light enough for lunch, yummy enough for all! Did you start a diet with the New Year? I’m seeing loads of posts of people talking about Whole30, Paleo, Keto, etc. I’ve been dieting since I was in my teens and now that I’m in my early 50’s, frankly, I’m tired! That’s a lot of years of being conscientious of what I eat, an uphill battle most of the time, don’t get me wrong, I don’t want to go off the rails, I just don’t want to worry so very much. I’m at the point in life where I want to be healthy, eat healthy, stay active and as long as I’m doing all those things, then I am okay with the me that I am. And if that means I’m carrying more weight than I’d like, well, C’est la vie! Does it mean I will never go on a “diet” again, nope, no guarantees! But for today, that is how I’m feeling. Would you join me in being okay with the you that you are? If you need to take steps to be healthy, by all means take them, but if you are doing just about everything you can and still haven’t experienced what the media calls “success” then join me in being kinder to yourself, loving the you God created you to be; resting more, stressing less; moving more, sitting less; loving more, judging less…especially our bodies and what the media says they should look like. 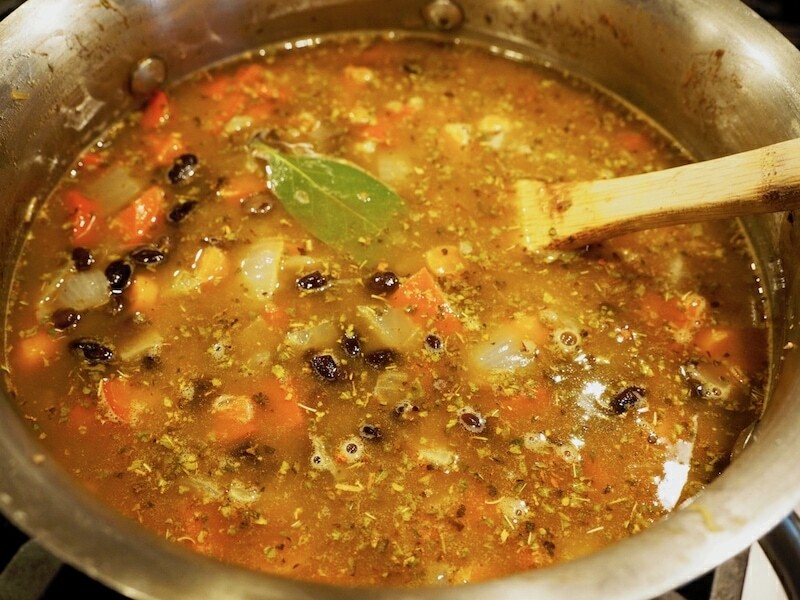 Let’s start eating healthy by creating this warm, delicious soup! 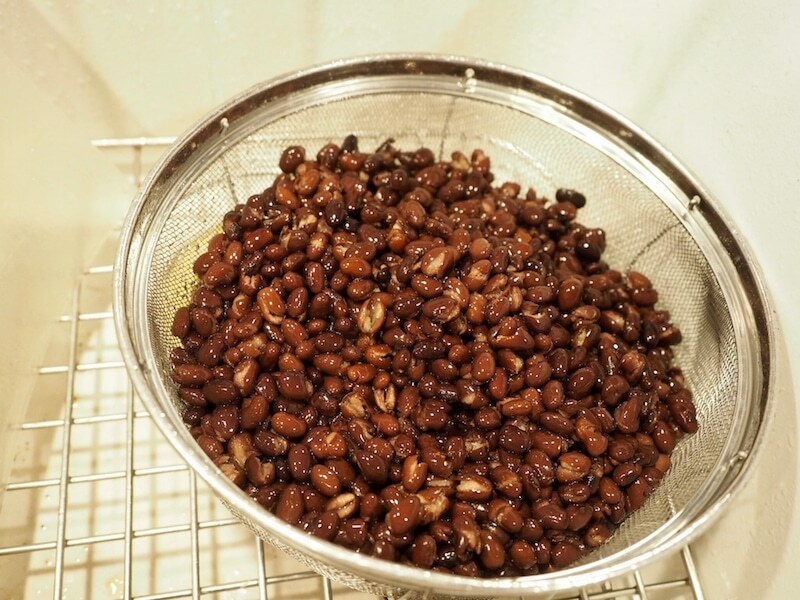 Open your beans, pour them into a colander, rinse and leave to drain. 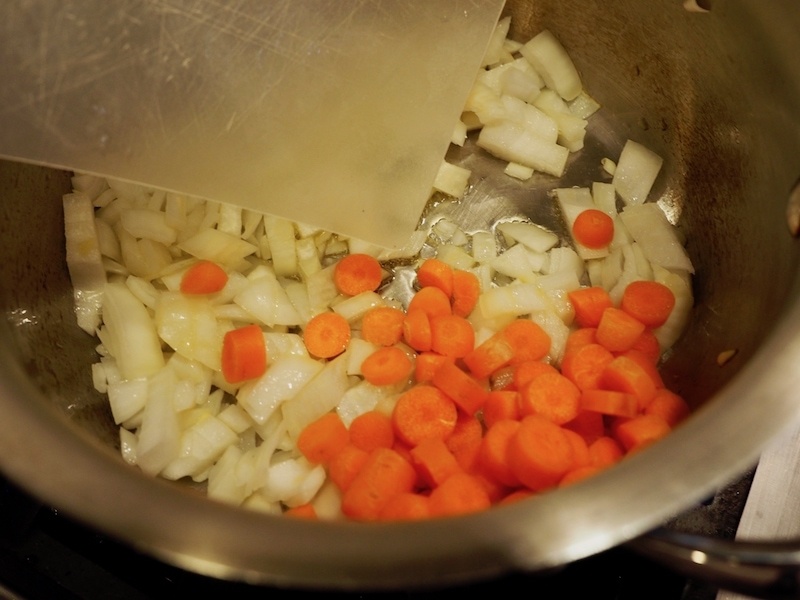 Heat your medium soup pot over medium-high heat, pour in a couple tablespoons olive oil and then add your chopped onion, carrots and garlic. While your carrots, onions and garlic are sautéing slice up your red pepper. 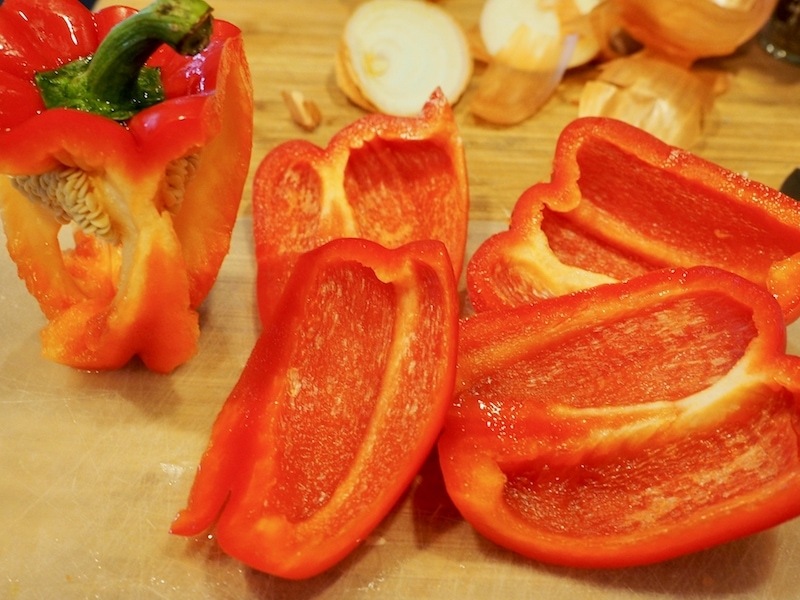 TIP: An easy way to slice up a bell pepper. Stand it on end and starting at the stem, slice down to the bottom of the pepper, slowly curving your knife with the curve of the pepper. 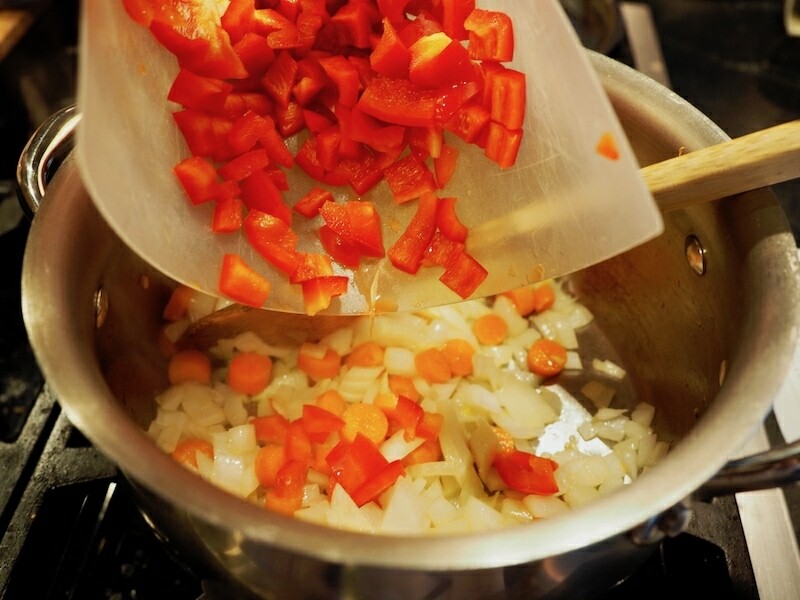 Chop up the red pepper and add to your onions and carrots, sautéing for a few minutes. 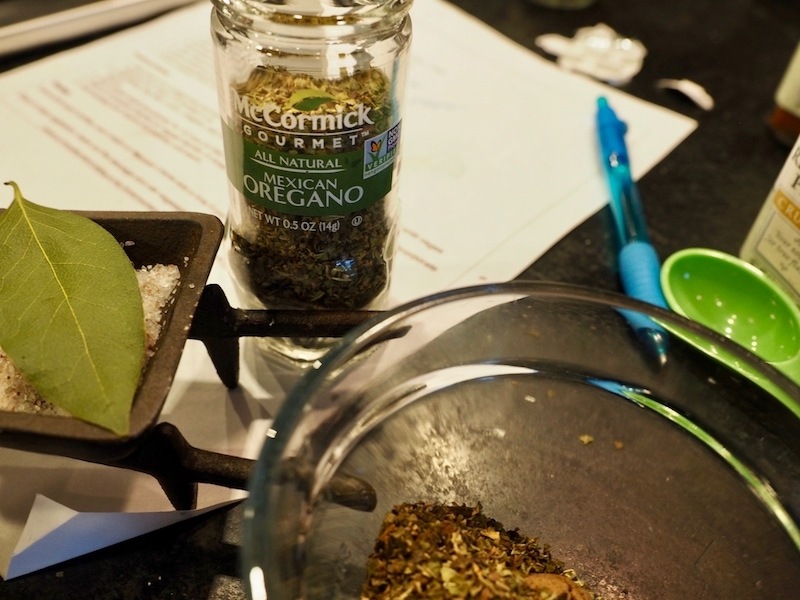 While your veggies are sautéing, add all of your spices to a small bowl. We’ll start with salt. 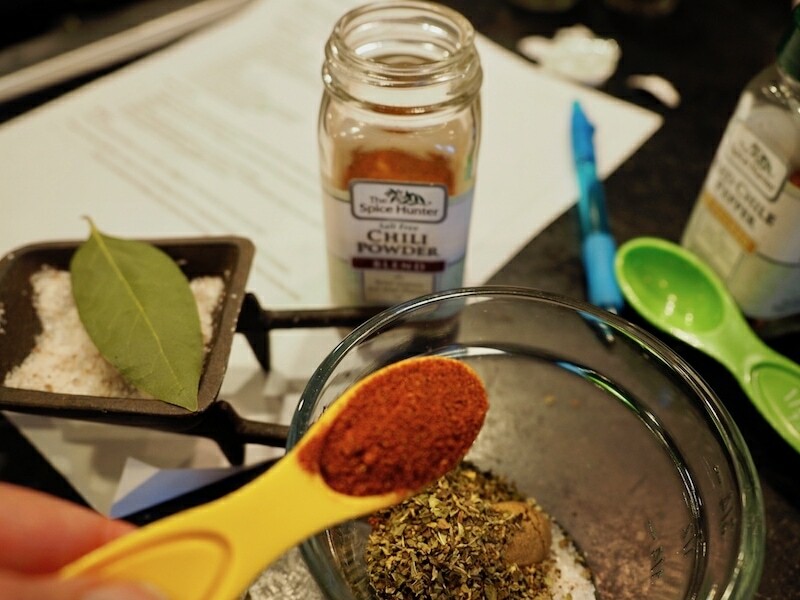 Chili powder…add more if you like your soups spicier, I am a known wimp. You may also add a shake or more of red pepper flakes. 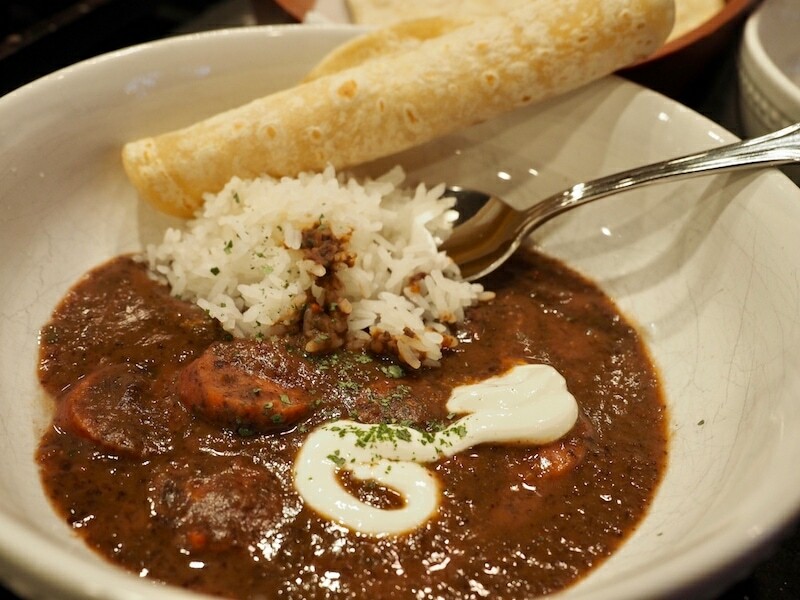 Finally toss in your bay leaf. 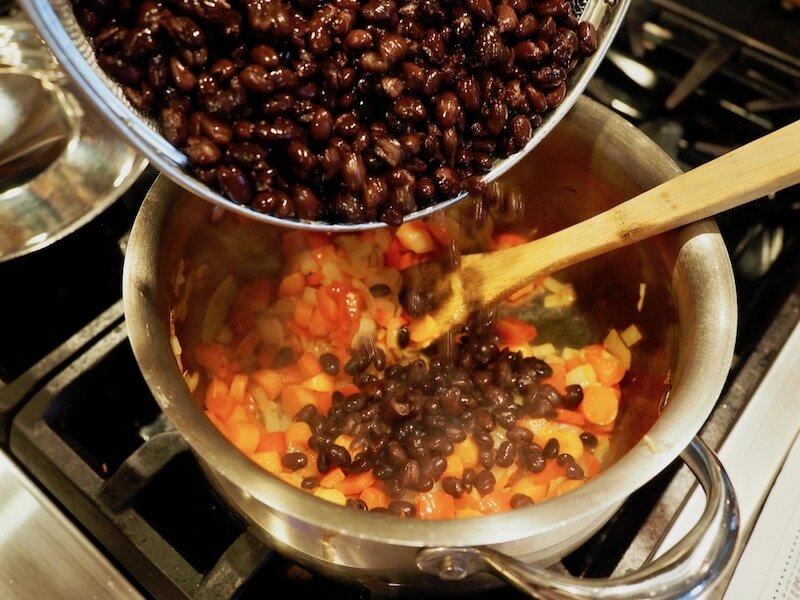 Pour your rinsed and drained black beans into the softened veggies and mix to combine. Dump in your spices and stir to combine. These next few ingredients are optional, but so worth the taste! Add sherry, orange juice and liquid smoke (hickory works great) (I use more for smokier flavor), stir to combine. (Sorry, I was rushing to finish the recipe and completely forgot to take pictures). TIP: Liquid smoke can be found in your grocery store, ours is located near the BBQ sauces, Worcestershire sauces, etc. If you have one, once the veggie and beans are soft, place blender stick in soup pot and blend until desired smoothness, I like my bean soup really smooth. You can achieve the same thing buy placing a couple cups of soup at a time in a regular blender or even better, in a Vitamix if you have one! Which I don’t, though I’d like one someday! 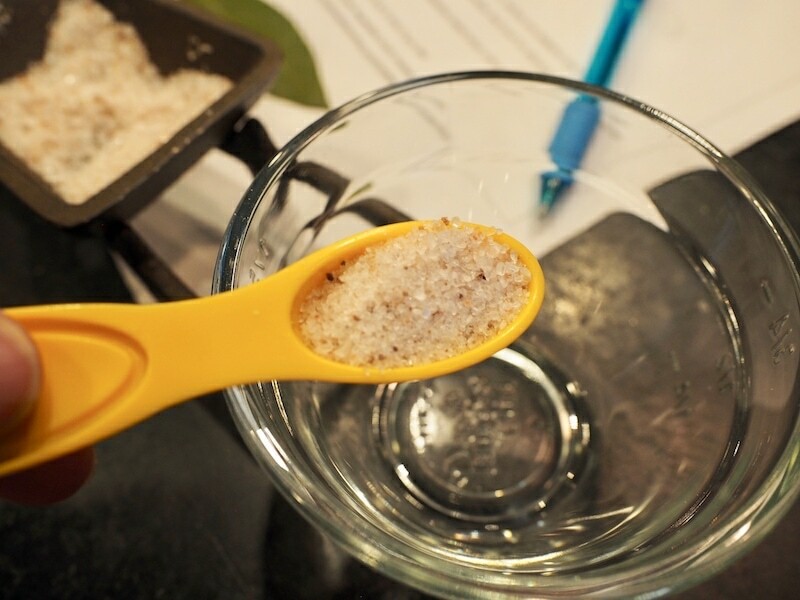 TIP: Remove your bay leaf, before blending! Look at those beautiful little swirls of creamy goodness. Once you’ve reached your desired texture, slice and add your sausage*. Heat until warmed through. *Obviously keeping the sausage out if you are making it vegetarian. 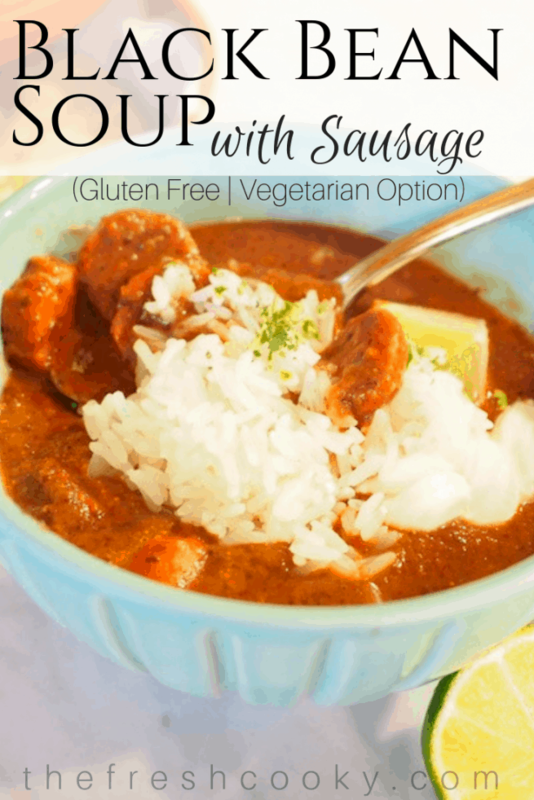 Easily convert this to a vegetarian soup by omitting the sausage and using veggie broth instead of chicken broth. Add your cilantro, I forgot to get fresh cilantro (much better) but I had some freeze-dried cilantro so I rehydrated it and poured it in. Finish by pouring in your juice of one lime…again no picture, sorry! Serve with a fresh wedge of lime, if you have it a little left over rice, put a scoop in. Crumble a little Cotija cheese or any other Mexican cheese. Jack works well too. Garnish with a little fresh cilantro and serve with warm corn or flour tortillas or crispy tortilla chips. PIN NOW | MAKE LATER! 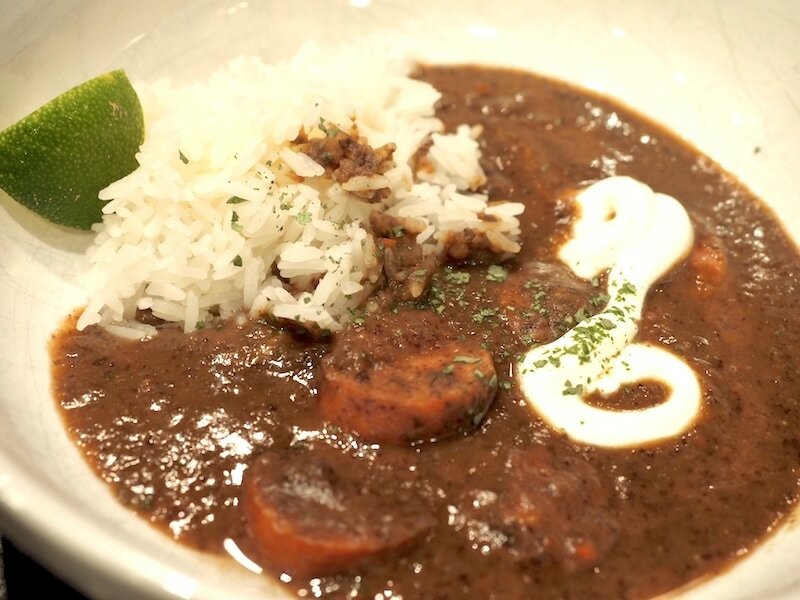 A thick, satisfying, hearty soup; filling enough for dinner, light enough for lunch! Creamy, smooth, flavorful, with hickory and citrus notes. Fully customizable with all sorts of delicious garnishes, it’s a family-friendly meal-sized soup! 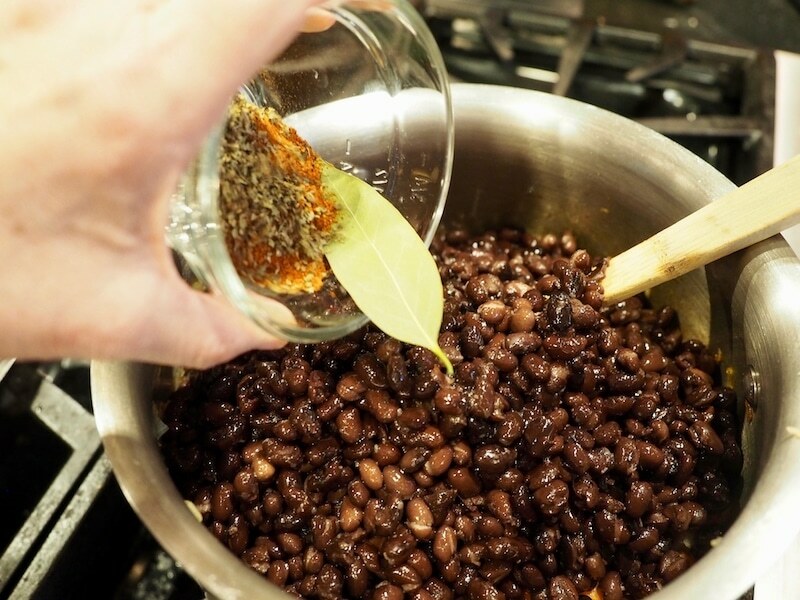 Drain and rinse black beans in colander and set aside to drain completely. 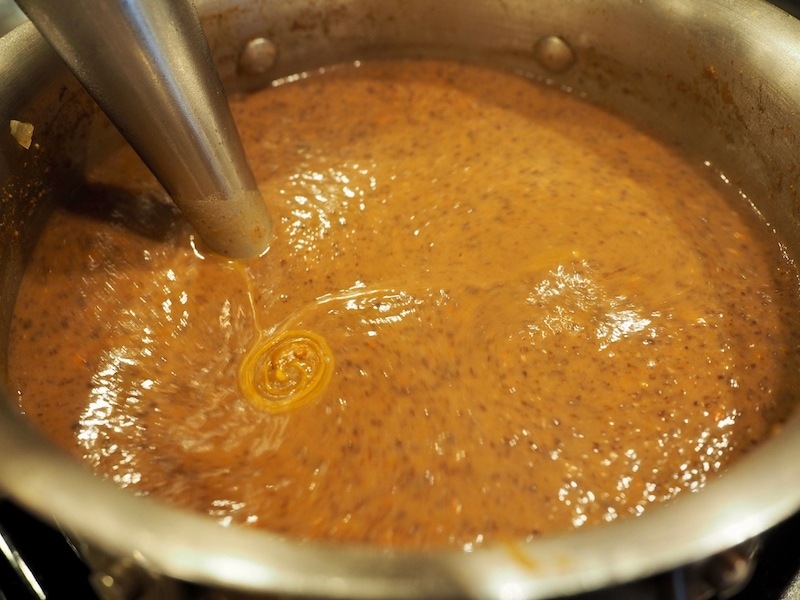 Heat oil in a medium-large soup pot over medium-high heat. Add onions, garlic, carrots and peppers, saute until soft and aromatic, about 10 minutes. While veggies are sauteing, measure all spices and place in small bowl, set aside. 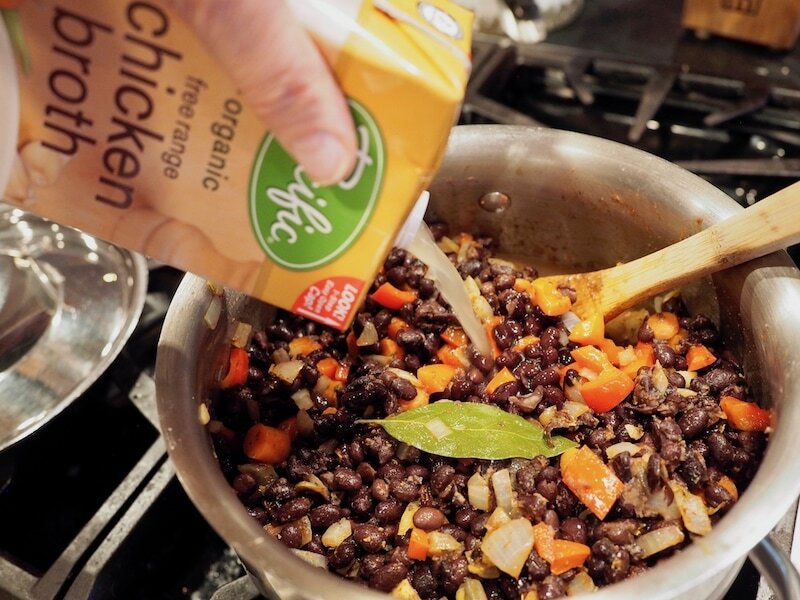 Once veggies are soft, add black beans and spices and stir cooking for a minute or two to combine flavors. 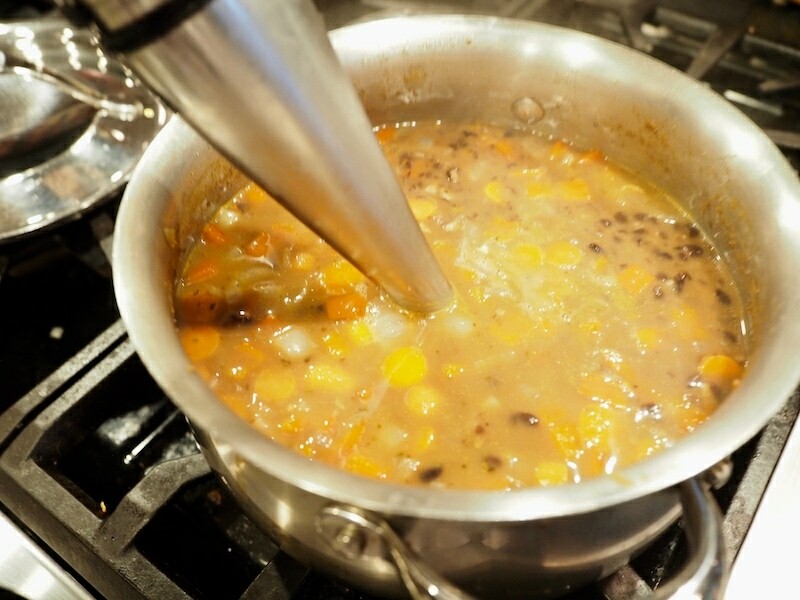 Add chicken stock, orange juice, sherry, and liquid smoke; cook for 30 minutes on low heat. 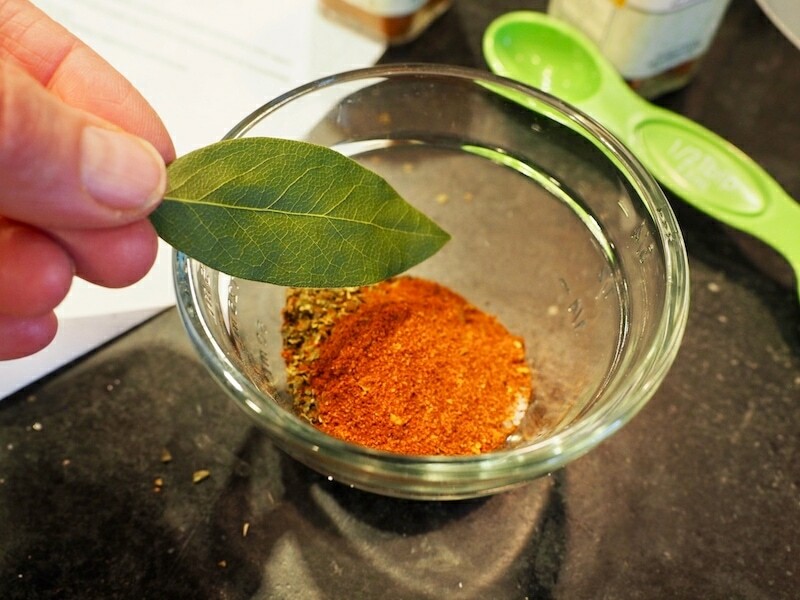 Remove your bay leaf before blending! 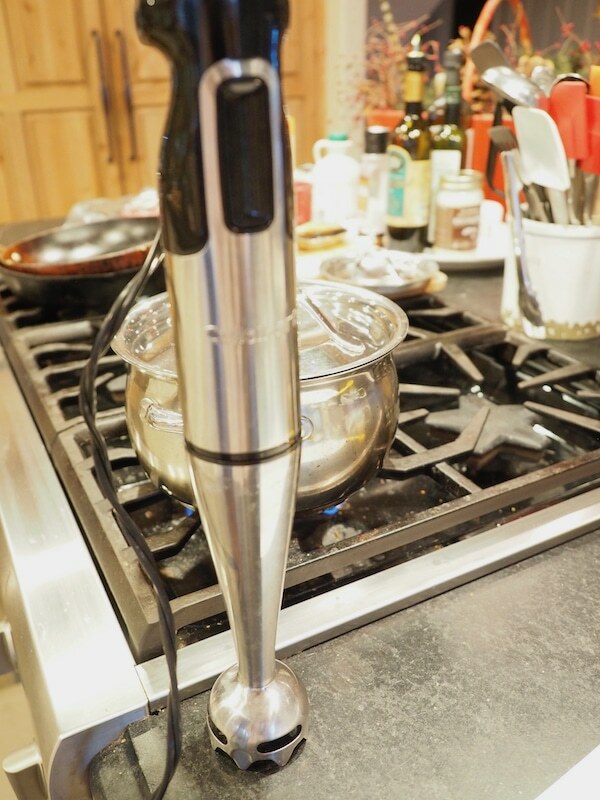 Using an immersion blender (remove bay leaf first) blend until smooth (or use a regular blender, in small batches). 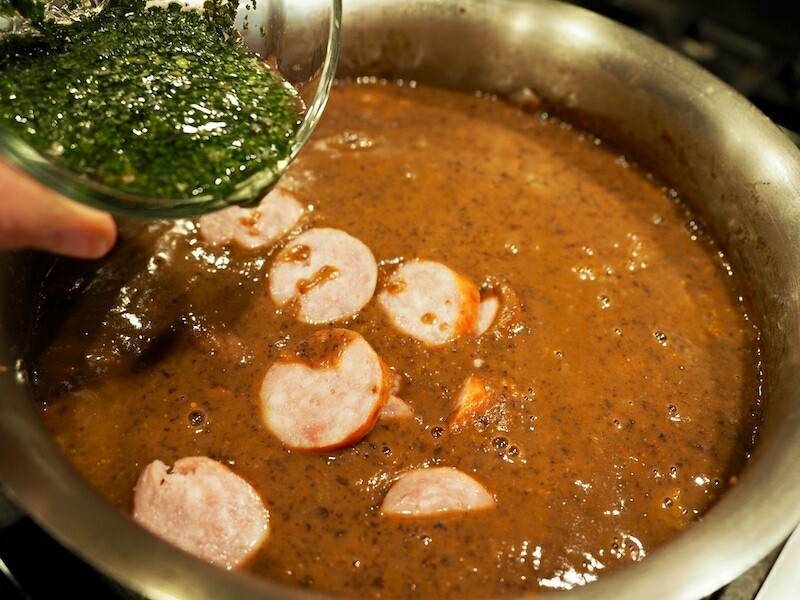 Add sliced sausage, cilantro and lime juice, simmer until warm. Serve with variety of desired toppings, especially delicious with a small scoop of rice, sour cream and a squeeze of lime, topped with crumbled Cotija cheese. Serve with warm tortillas and variety of desired toppings, topped with a squeeze of lime. This recipe is easily turned vegetarian, omit sausage and replace chicken stock with vegetable broth. 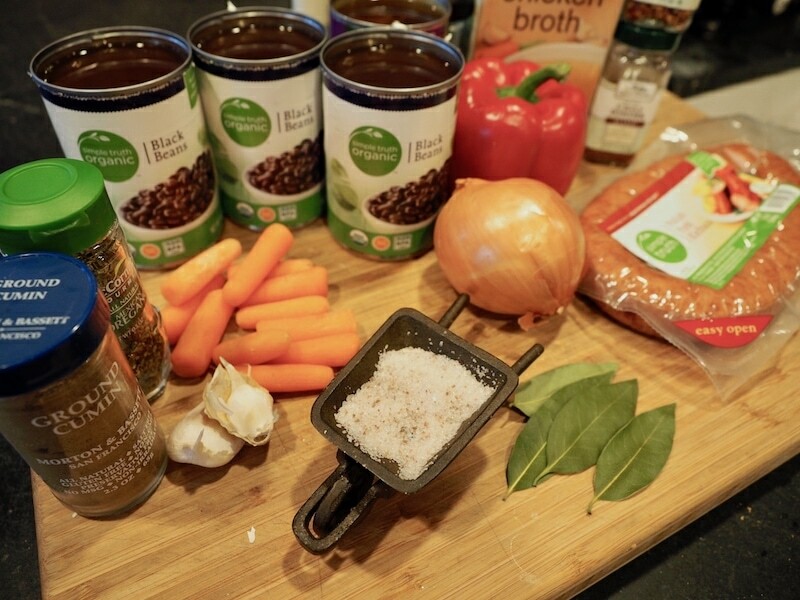 Copyright 2018 | This recipe for Black Bean Soup with Sausage was featured first on The Fresh Cooky. 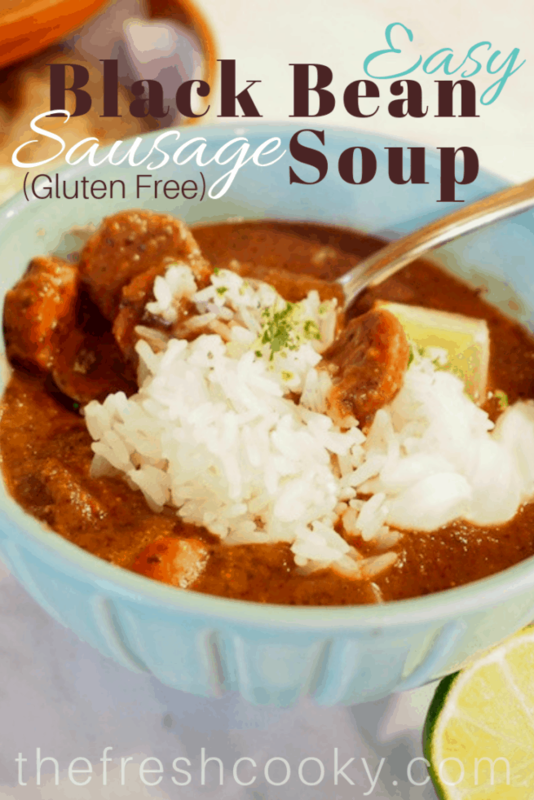 I was just looking for something warm and yummy for this weekend’s snow, this soup looks perfect! Can’t wait to try it! Thanks Kimberly!! Let me know your family thinks!